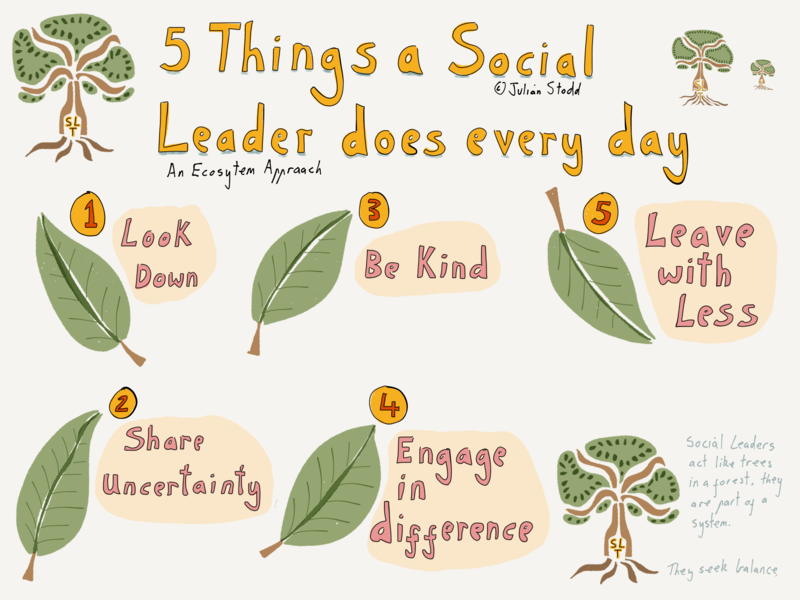 Social Leadership is not just about thinking, it’s about taking action, every day. The culture of an organisation is co-created through the actions of every individual, in the moment, through the things they say and do. So whilst our journey to Social Leadership may start with introspection, it rapidly moves to action. As we curate our space, take our stance, and find our power, so we can choose our actions. These five may not be the ones that you choose, but the point is that you must choose something. 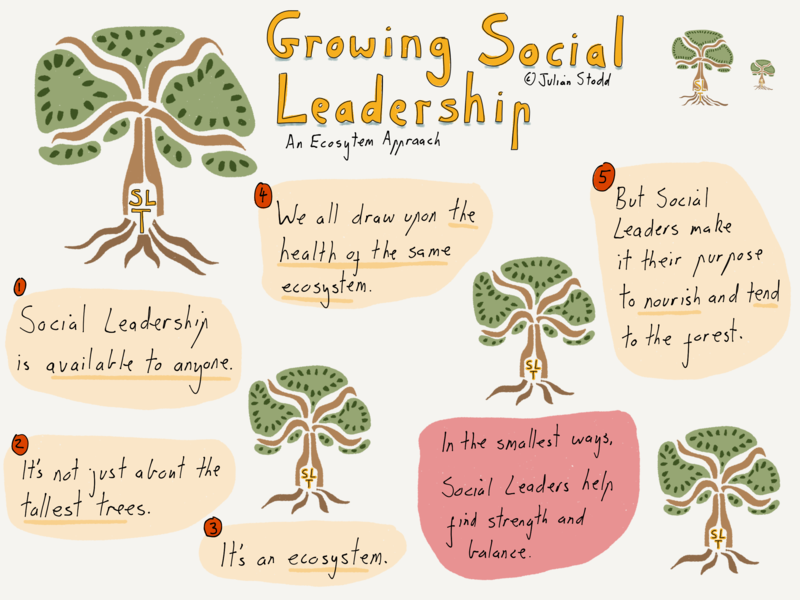 It’s fine to be a Social Leadership thinker, but better to be a Social Leadership Practitioner, and through your action, help transform the culture, and build the reputation that will establish your power. Remember, Social Leadership is a power that is earned outside the system, not granted within it. 1. LOOK DOWN: in our efforts to be effective, we are often reliant upon the largesse, permission, and resources, of those above us. We have to learn to ‘influence up’, and to operate within the space given to us. But every day we should take the time to look down: to understand, support, encourage, learn about, or recognise, the efforts of those less senior than us, be that within our team, in a different part of the organisation, or even someone who is just joining. Engage to learn, not to share, not to teach, but to listen. Take time every day to help someone further down than you to be effective, and know that the connections, the kindness, and the reputation you earn by so doing will serve you as well as ambition and the generous power of those above you. 2. SHARE UNCERTAINTY: in a space of established power, we often have to demonstrate certainty as strength. Ignorance is not viewed as bliss: it’s weakness. And yet none of us have a clear view of the future state. Indeed, we may need to work together, through shared uncertainty, to create that future state. To achieve this, we should be prepared to share our own uncertainty, to demonstrate strength not simply through determination and knowledge, but through humility and our own, accepted, ignorance. Not wilful, but humble. 3. BE KIND, and find kindness as a strength. To be kind every day, in our actions, our deeds, is an investment in ourselves, and our community. But it can be remarkably hard to be kind. Consider the people who you see everyday, and the people who you pass by, but never really see. Kindness can be a word, a gesture, an action, either seen or unseen. Making kindness a conscious part of our Social Leadership practice is part of our deliberate journey, to create the culture that we desire. 4. ENGAGE IN DIFFERENCE: not just the things we already know to be true. Engaging in difference, not to conquer it, not to disprove it, but rather to learn from it, is challenging. But it’s our ability to engage in our differences that will set us apart from territorial formal leaders. To build the Socially Dynamic Organisation, we will need to become more interconnected, not simply across the lines that we know and understand, but those that sit beyond our understanding, and sometimes across lines that we actively contest. A true Social Leader can be comfortable with their own discomfort, and create space for others to be comfortable with their own differences. Remember, the Socially Dynamic Organisation is strong through diverse thinking, not despite it. 5. LEAVE WITH LESS, every day. Come out of your day with less than you went into it with: share your resources, share your stories, your wisdom, your ignorance. Give more than you take, and offer more to others than you ask for. This is not a trite assertion to be ‘better’, it’s an encouragement to take stock, everyday, of whether you are in debit, or credit, to your community. If you end a day winning, take the time to give something back. And if you feel you have lost the day, give more. By giving, by leaving with less, we gain more. This entry was posted in Social Leadership and tagged Kindness, Leadership, Lists, Social Leadership. Bookmark the permalink. This was an amazing share. So simple. I’ve added it to my daily routine. My favorite is look down and leave with less. I’ve setup for my morning journal this post until it becomes natural and a habit for me. The two I’ll have to work harder on will be engage in difference and share uncertainty.